The South Placer Bus Pass Subsidy Program is a two-year pilot program offered by PCTPA, acting as the Western Placer Consolidated Transportation Services Agency (WPCTSA), to provide short term transportation to non-emergency medical care and general public assistance services for low income residents of Placer County. “The South Placer Bus Pass Subsidy program is designed to help low-income residents with the cost of public transportation to medical or assistance services,” said David Melko, Senior Transportation Planner with PCTPA. “Agencies eligible to provide the bus passes are human services, social services, and non-profit agencies and organizations.” Eligible agencies can provide transit day passes for fixed route buses from Auburn Transit, Placer County Transit, and Roseville Transit to clients who participate in programs listed here. Every month, agencies can receive a reimbursement of up to 75% for bus passes they purchased. This helps offset the cost of travel for many Placer County residents, and also increases accessibility to local assistance programs and medical appointments. All residents should be able to travel from Point A to Point B in a safe and convenient manner. 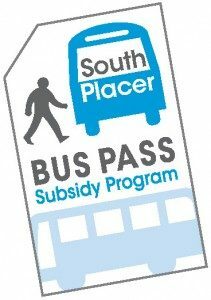 The new South Placer Bus Pass Subsidy program is helping to make this a reality in our region, one agency at a time. You can learn more about the program here.